The annuality of the Arab countries has been one of the most common dreams of the majority of Arab nations for many years, the day when dreams came true among the three great Arab countries, but the dreams were not perfect, and the end of unity was announced less than 100 days after the announcement of the last and smallest unit. Modern Arabic. On 17 April 1963, the leaders of Egypt, Syria and Iraq signed a document establishing the United Arab Republic at a time when the masses in Baghdad, Damascus and Egypt expressed joy in the new country, and scandalized the slogans of Arab unity, freedom and socialism. The history says that the tripartite unit was built on the ruins of a Syrian-Egyptian unit that ended almost a year earlier and the end of Syrian-Egyptian unity was proclaimed on September 28, 1961 due to disagreements in the administration of the United Republic of Egypt. The journalist and author Salah Issa says about the response to the announcement of a tripartite unity that "celebrates the unity of the Arab world, celebrates the proclamation of a new unity, and expects the true beginning of the unification of the entire Arab nation". "The secession that led to the collapse of the Syrian-Syrian unit on September 28, 1961, was not shorter than a year and a half," Issa said in a historic article on the period until the declaration of a tripartite unity between Egypt, Syria and Iraq. On February 8, 1963, the Iraqi army demolished the rule of Abd al-Qari Qasim, who refused entry into the Republic of unity and raised the slogan "Republic is not territory". New Iraqi leaders have not only announced they are seeking Arab unity, Two weeks after sending a high delegation to Cairo to participate in the February 1963 celebration of the Unit. " "On the Syrian front, says Issa," … Two weeks later, elements of the Syrian army were all surprised by the beginning of the revolution that ended the rule of the separatists who demolished the Egyptian-Syrian unity and declared that they were seeking Arab unity. In Syria, which was before the complication of separation when the Northern Territory of the United Arab Republics. " In fact, two Syrian and Iraqi delegations arrived in Cairo for a week after the Syrian revolution and met with President Gamal Abdel Nasser to launch a series of joint meetings that reached 19 meetings during a period of one month in which they discussed the establishment of the Unity and avoidance crises that led to the end of the Syrian-Egyptian unity in the past. Ahmad Baha al-Din, in his book The Crisis of the Agreements on Tripartite Unity, said that members of the Syrian and Iraqi delegations at the first meeting noticed Gamal Abdel Nasser not to hurry after the unification. "This is a task that can not be achieved without re-evaluating the experience of the Syrian – Only 44 months, in particular, that the Baath party who participated in this unit initially supported the separation. Following the "tripartite unity agreement", the July 23 revolution was a historic turning point in which Arab people in Egypt discovered their own will and the path of freedom, Arabism and unity. What was done with the Savior in the Revolution of July 14 and the March 8 revolution in Syria in the rehabilitation of the unit that was murdered due to the fall of the reactionary secession after this revolution that broke all the obstacles that the separatists and colonialists determined firmly on the path to unity. " The document emphasized that the leaders of the three countries acted according to the will of the Arab masses, who strive for unity and strive for its realization, protecting and preserving it, and knowing that the core of a firm unity is the unification of the parts of the homeland that they have acquired freedom and independence, and decided the national governments to eliminate the feudal union and liberate the people's workforce to assess their alliance and express their true will. " In a tripartite unity document, it was agreed that "on behalf of the United Arab Republic, the federal state will be based on a free-liaison between Egypt, Syria and Iraq, and the names of the members of the state will be the Egyptian state, the Syrian state and the Iraqi state." They also agreed that "every independent Arab republic, which believes in the principles of freedom, socialism and unity, has the right to join this country with a free will of the people and join it after the approval of the constitutional state of the state." The document emphasizes that the capital of the country is the city of Cairo and that citizens of a federal state have one nationality, Arab citizenship enjoyed by everyone who enjoys the citizenship of the Member States and whose provisions are governed by the federal law. The document explains how to manage the federal state and its institutional relations. But all this was merely "maneuvering" according to the description of President Gamal Abdel Nasser himself, who described Nasser as a response to the campaign of some Syrian newspapers that began the day after the signing of the unity agreement where Syrian newspapers condemned the Arab Socialist Union in Egypt , Just to "fill workers and farmers" and, on the other hand, respond to Cairo newspapers and attack the Syrian party Baath. In mid-May 1963, the Al-Ahram government daily published the full text of the talks about the unit and its content, and then Egyptian radio stations transmitted the contents of Al-Ahram to all parts of the Arab world. 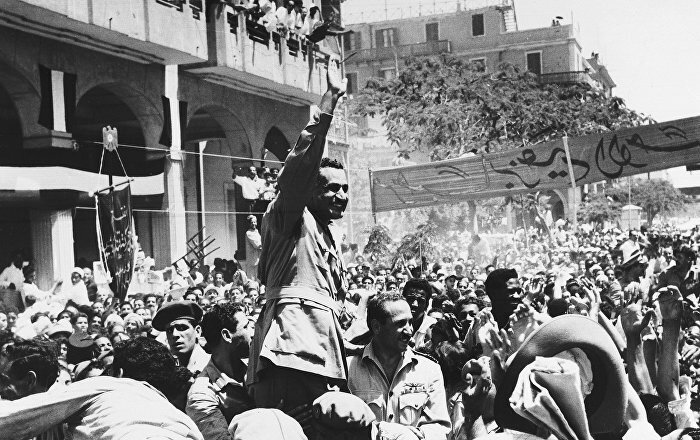 The end came when Gamal Abdel Nasser addressed Cairo at the celebration of the revolution on July 23, 1963. He reviewed the circumstances in which the tripartite unity pact was reached, and accused the Syrian party of Baas of not being united by unity and under pressure to press Syrian and Iraqi delegations. Human demonstrations demanded unity, at a time when it did not exacerbate their rule in the country, and almost this was achieved until it began to attack unity and tried to prevent them, and concluded its speech, announcing the withdrawal of Egypt from the Charter on triangular unity.